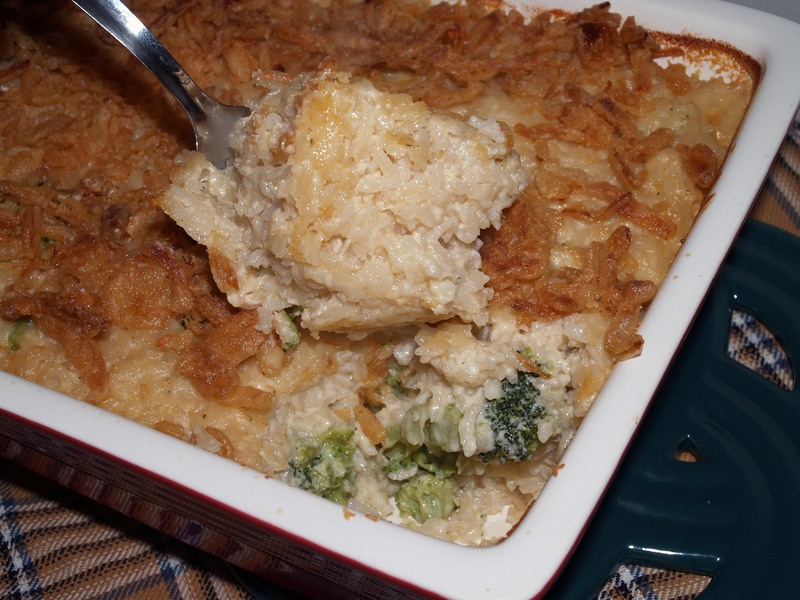 Cheesy Broccoli Rice Casserole | I Wanna Bake! Now that we’ve weathered the deluge of chocolate-laden desserts that precedes Valentine’s Day, it’s time to get back to everyone’s other favorite comfort: cheese. I first saw the idea for this recipe in a Tasting Table post. The original recipe sounds pretty good as is, but I chose to modify it based on my husband’s and my personal preferences. Josh hates Velveeta, and both of us aren’t too keen on Swiss cheese, so I dropped the Velveeta and Gruyère. At the time I made this, we were still swimming in cheese from our New Year’s cheese-a-thon, so I tried to work with what I had on hand. Somehow, I ended up with more new cheese after this, but hey, it’s Comfort Food Month. [Side bar: somehow, I didn’t have a cheese tag until now. This gross oversight has been addressed.] The more cheese, the better! I ended up with a combination of Havarti, cheddar, and Gouda. You’re welcome to substitute any cheese you like, provided it melts decently well (I’ve got my eye on some double Gloucester, myself). Smoked cheeses would be particularly nice if you’re looking for some added warmth. If you’re into moldy cheeses, you could probably get away with adding a little blue cheese, and if you prefer your cheese sharp, you can always swap in some extra-sharp cheddar. The cheese is in your hands. I only discovered this while writing this post, but the sauce I made is a variation on Mornay sauce. 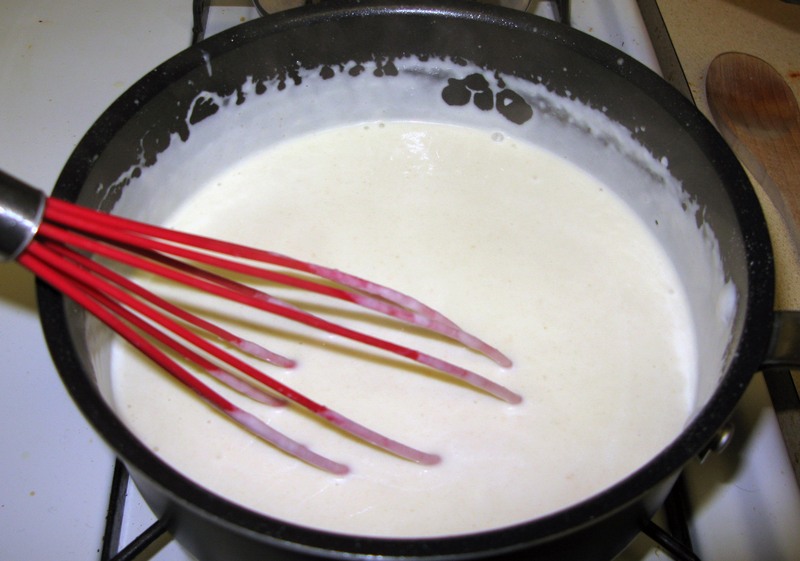 Mornay is traditionally made by adding grated Gruyère cheese to Béchamel sauce (one of the five French mother sauces). Since I used other cheeses (see above), I suppose this isn’t technically Mornay, but I’d say it’s close enough. Either way, the procedure is the same. [Don’t worry, this sauce isn’t hard at all, despite all the highfalutin French words being thrown around.] 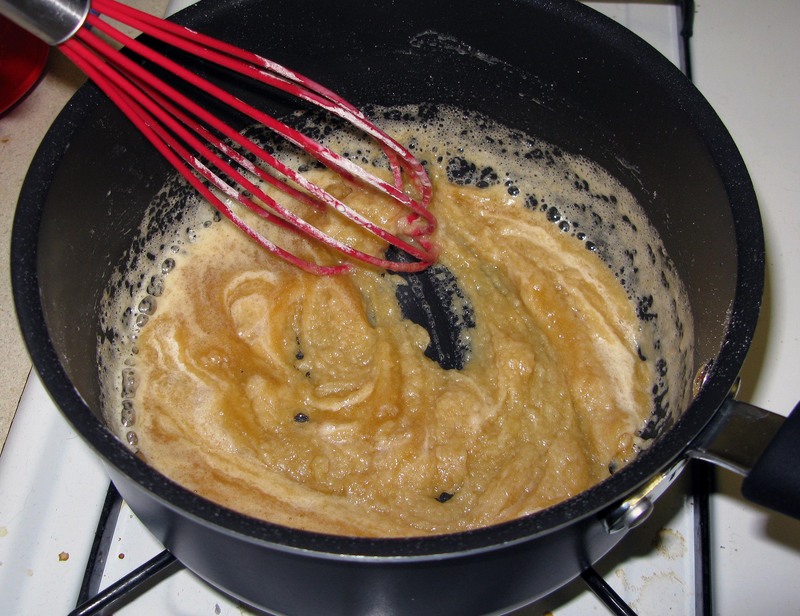 It starts off with a roux (I know, I know, more French), which is just flour cooked in an equal amount of butter. 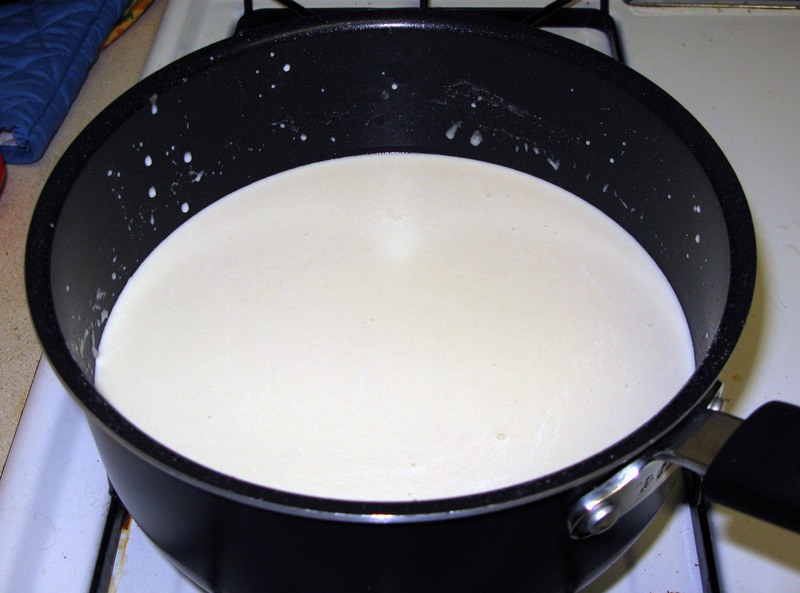 Heavy cream gets added in incrementally, then some milk. Once the roux and dairy thicken, you take it off the heat and whisk in the cheese until it’s completely melted and you have a pot of velvety, cheesy goodness sitting in front of you. That’s all there is to it. I have half a mind to try this again with Brussels sprouts instead of broccoli. I also want to try adding in some bacon and starting my roux with bacon grease instead of butter (this is how I make baked mac and cheese, and it’s to die for). Ham and peas are another solid combination that would lend itself nicely to this casserole. Consider this your invitation to experiment (and to share your notes with me!). I’ve been in the mood for Slade recently. Obnoxious misspelling of song titles aside, their music is just fun and bouncy. You’ll need that to counteract all that cheese you’re about to consume! 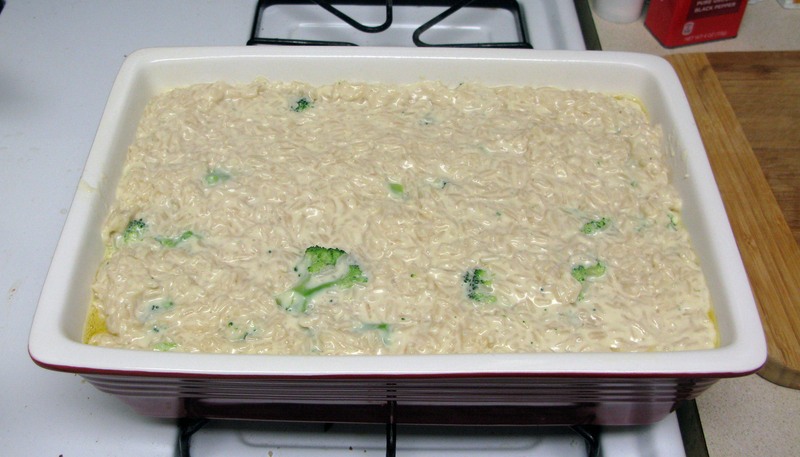 Preheat your oven to 375°F and grease a 9″ x 13″ baking dish. Set aside. Chop and steam your broccoli. Set aside. In a medium bowl, toss together the grated cheeses until combined and cut the Havarti into ¼”-½” cubes. Set aside. 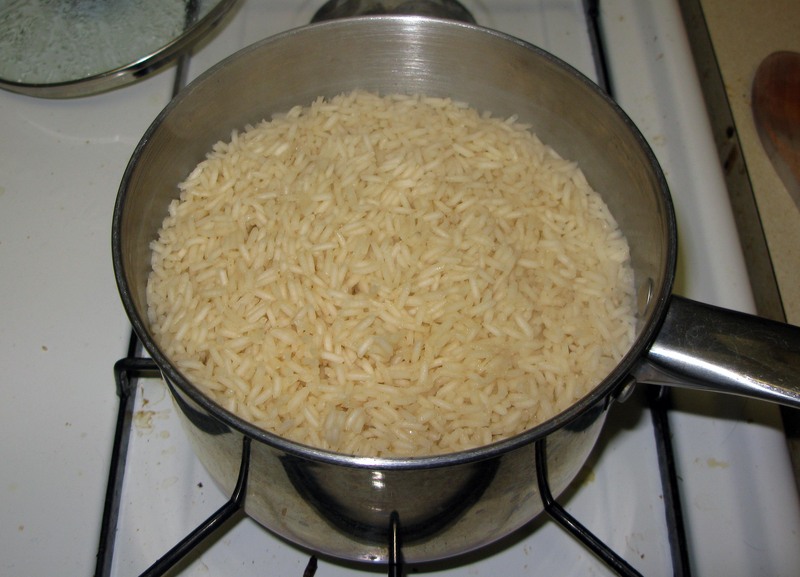 Combine the rice and chicken stock in a medium saucepan and bring to a boil. Stir, reduce to a simmer, and cover. Cook the rice for about 10 minutes, or until it is mostly cooked and the chicken stock is absorbed. Remove the saucepan from the heat and leave it covered. Meanwhile, in a large saucepan, melt the butter over medium heat. 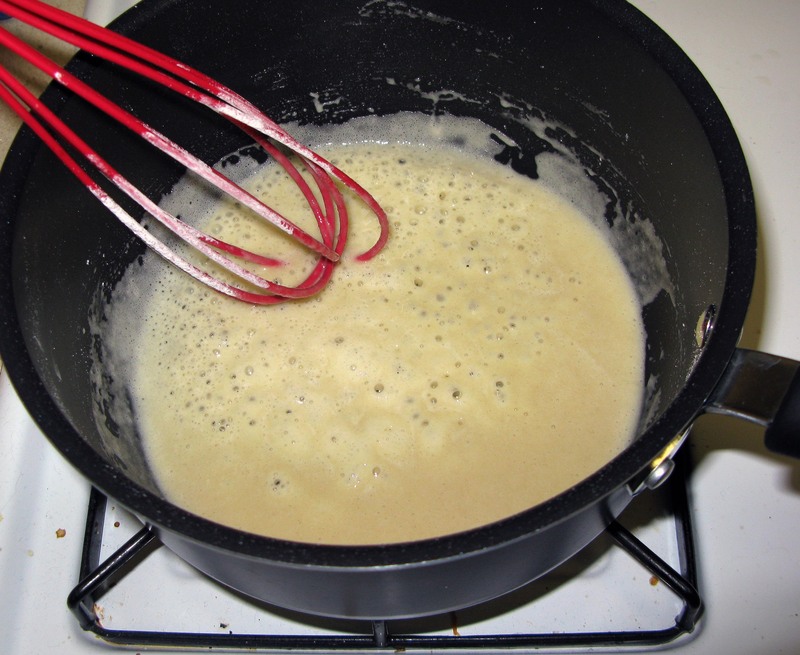 Whisk in the flour until smooth (this is called a roux). 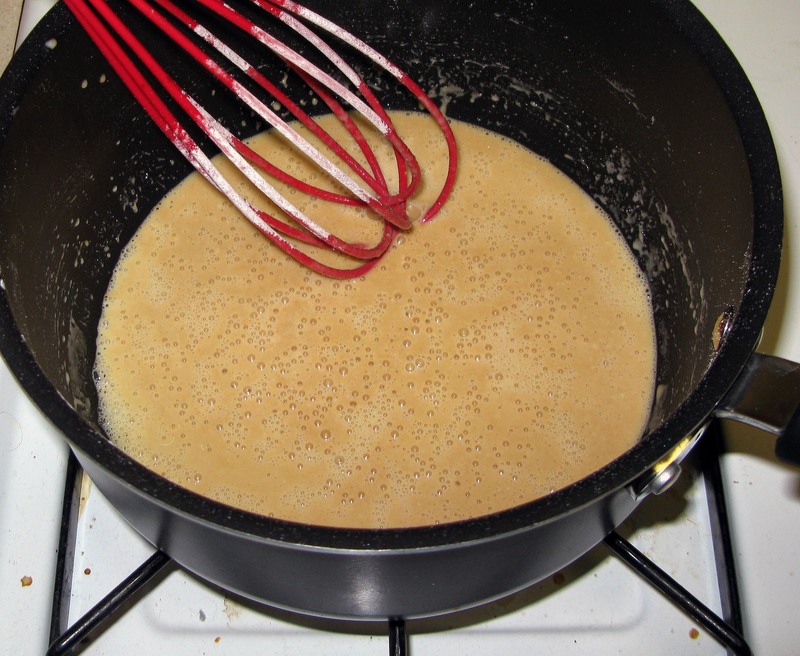 Cook the roux, whisking regularly, until browned. A little bit at a time, whisk in the heavy cream. Whisk it until all the cream is fully-incorporated after each addition. At this point, you will have a thick mixture. Next, add the milk, whisking continuously. Now you’ve got Béchamel sauce. Raise the heat to medium, still whisking continuously, and bring the sauce to a simmer. Continue to cook it until it thickens. As you can see in the picture below, the sauce will stick to the side of the pan when swirled. Remove the pan from the heat and whisk in the Havarti cubes until they melt completely. 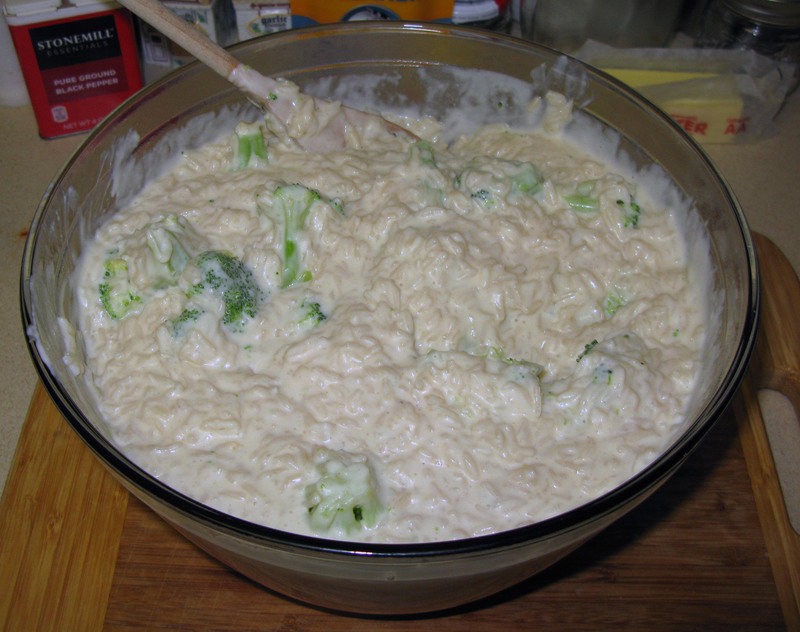 Next, whisk in the remaining grated cheese until you have a smooth, creamy sauce. Voila, Mornay! 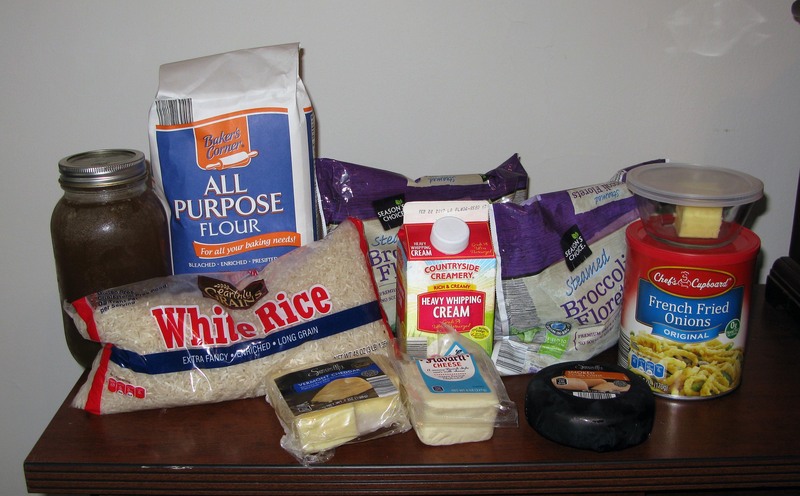 Since you will have such a large volume of ingredients to mix together, it’s time to break out the big mixing bowl. 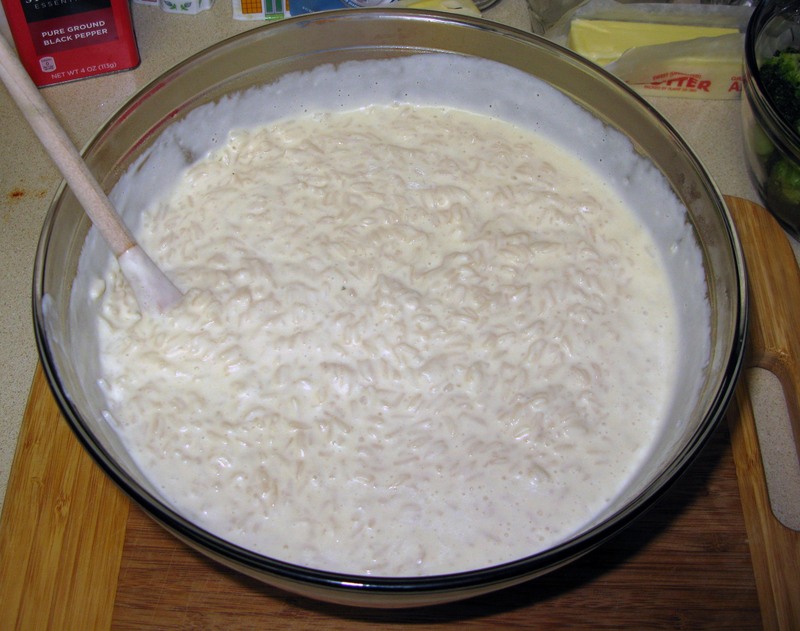 Transfer the cooked rice into the mixing bowl and stir in the Mornay sauce until the rice is evenly coated. Fold in your steamed broccoli and season the mixture with salt and pepper to taste. Transfer the mixture to your prepared casserole dish. Bake for 25 minutes. The cheese sauce should be bubbling around the edges at this point. Sprinkle the fried onions evenly across the top of the casserole and bake for about 5 minutes longer, or until the onions have browned. Let the casserole cool as long as you can possibly wait, then serve it warm. [I like it with some grilled chicken, but it would go nicely with just about any meat and/or a salad.] Refrigerate or freeze leftovers.